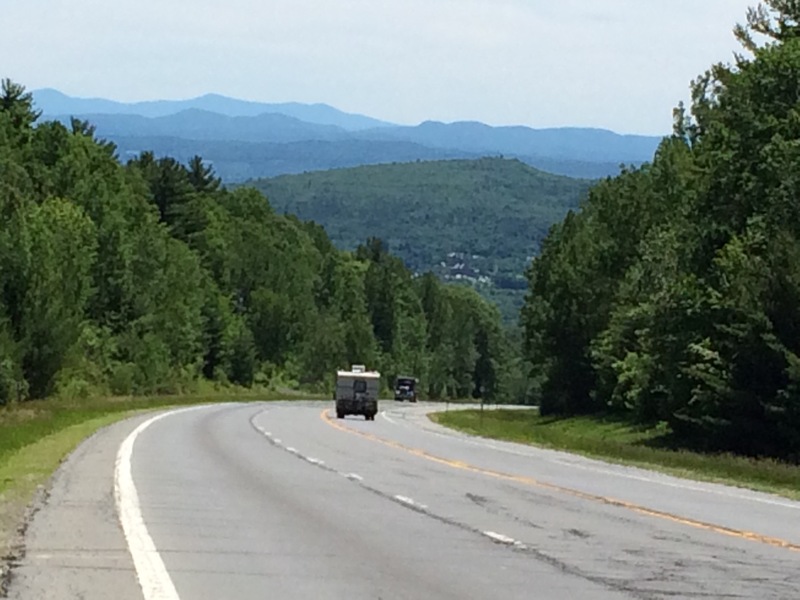 It was meant to be that I didn’t push on up past Ticonderoga that rainy late afternoon, because the following day was postcard perfect weather which meant zero-humidity, a gentle breeze, and fantastic views of the Adirondack mountains behind me and ahead of me. I had a cup of free in-room coffee, cleaned the grit and lumps that were stuck to my cogs and chain after the rain, re-greased, and was out by….. noon. I was taking my time outdoors and not in any hurry! I felt so rested and optimistic, that the hill that seemed onerous the day before was a now a playground, and I kept stopping safely on the far edge of the shoulder to look back in wonder. Once I got past the peak, the route was rife with pleasant rolling hills and an endless number of rivers, lakes, and ponds. I stopped at one to take a photo in Schroon, and a pickup truck with a couple of Vietnam Veteran bumper stickers pulled over and the gray-goateed driver in cool shades and a military hat offered, “want me to get one of you and your pup together?” Dave parked, snapped a few shots with his finger in front of my phone camera’s lens, then kindly re-shot some pics. He asked where I was going. “Seattle… Washington?” he exclaimed before inquiring as to whether I was doing this for a cause. 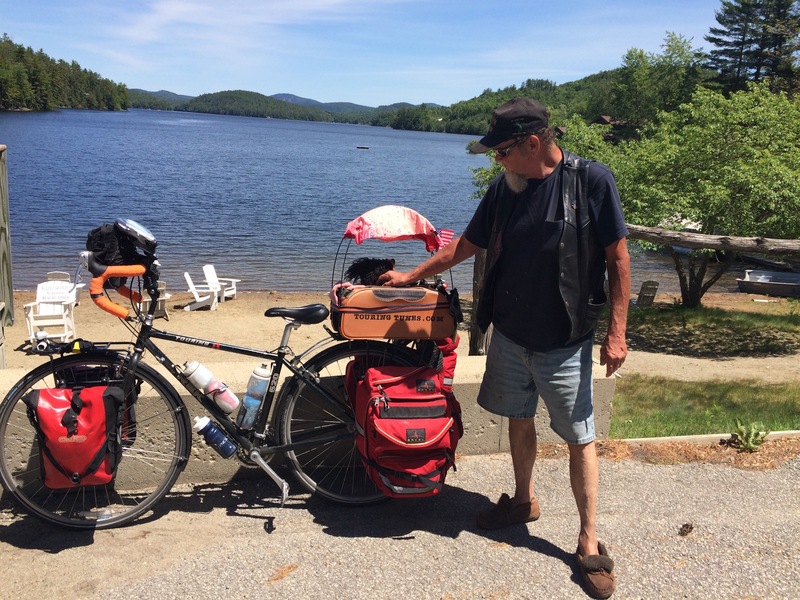 He began pulling money out of his wallet as I was telling him about Gearing Up (reminder– if you’re enjoying this blog, please consider giving a gift here: http://www.gofundme.com/touringtunes2015), to generously offer a donation. He asked if I needed food or water, and I thanked him for all of his kindnesses, as I’d enjoyed our fun little encounter and chat. “God bless you!” he said, and so I replied, “and you too!” He walked back to his truck, quipping over his shoulder, “and if he doesn’t, it’s my own fault!” I waved as he drove off and shouted “Thanks again! Take it easy.” And in an almost Lebowski way, he replied, “I’ll take it any way I can get it!” and drove off into the hills. 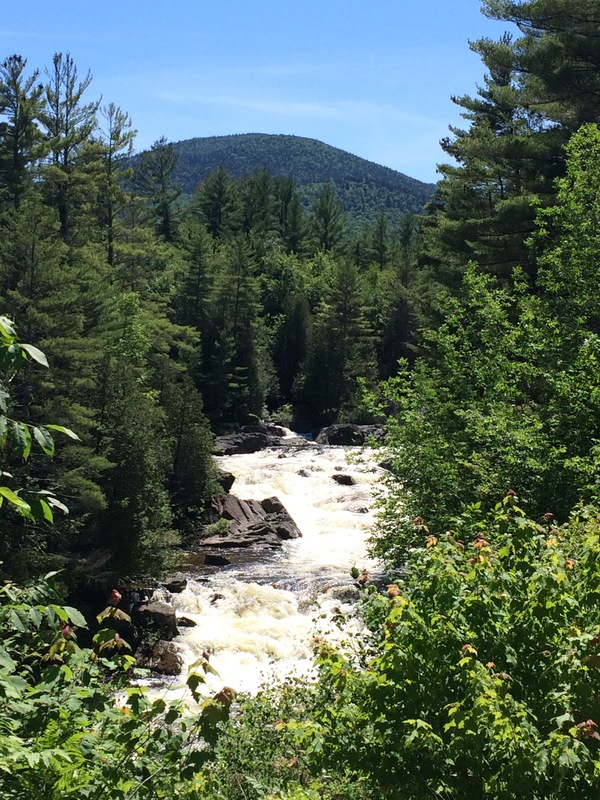 There was virtually no other traffic, and I stopped to enjoy roadside waterfalls, huge blue lakes walled in with emerald mountains, and basked in the inimitable smell of Adirondack pine. 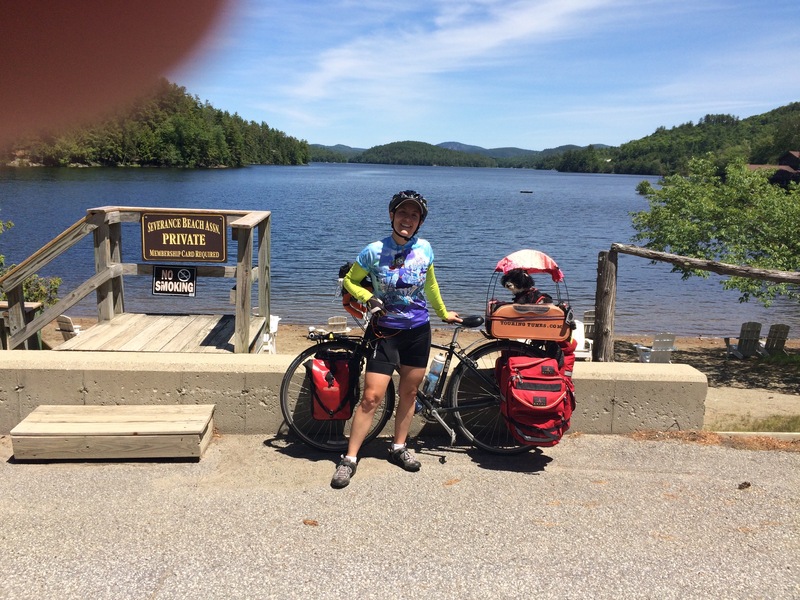 We stopped for a little lunch of PB&J, and apple, and a granola bar, and rode gleefully until a very tiny place called Newcomb, where the one store in town had burned down. We went to the emergency medical services cabin and tapped on the door. An older man came out and let us refill bottles, and he even had a couple of dog treats for Tunes! 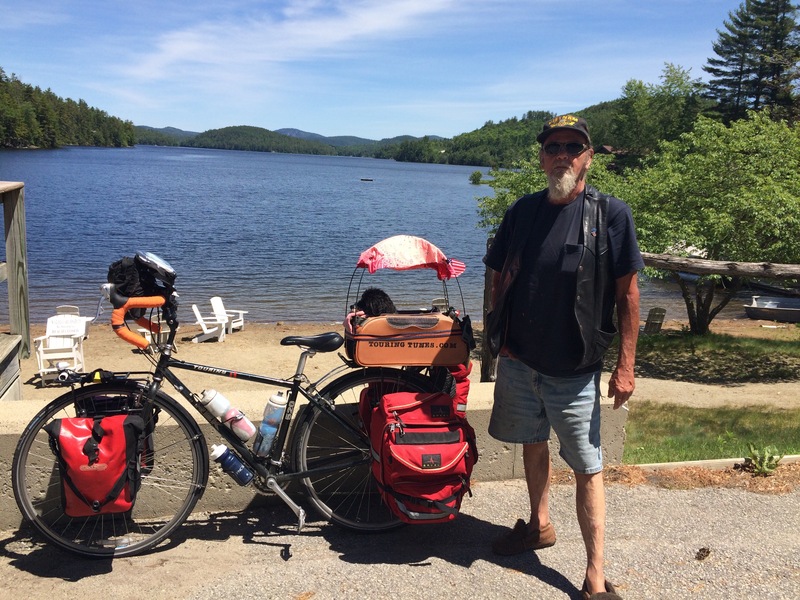 He told us that there was a restaurant in town but it would probably be closed by then, and that our best bet for another comfort station would be about a dozen miles away in Long Lake. So we hustled on until 6ish, and luckily, the one gas station/store in town was pretty well stocked, and had cheeseburgers for a buck and a half! I split one and an ice cream cone with Tunes, and asked the cashier where I might be able to access the water if I wanted to take a dip (not clarifying that by “take a dip” I meant “have a bath”). He told me of a couple of places with easy water access, mentioning that one was more secluded than the other. Bingo. The water was a bit cold after a couple of days of rain, but still very refreshing after a warm day of sweaty riding. Petunia sat on a nearby dock and watched, not caring to take a leisurely swim. There wasn’t anyone around and it was pretty secluded, so I set camp in the woods not far from there, in an absolutely gorgeous spot with a view of the lake, which became a luminous amethyst as it reflected the watercolor-painted, storybook sunset. And then, in a moment of unfettered grace, the low, musical wail of a loon echoed across the lake as soon as my head hit the inflatable pillow and I nestled my pup in the tent. It was almost so perfect, I might have felt guilty for enjoying it all to myself, but sleep had overtaken me just moments after hearing the lake bird’s song. Song of the day: I’ll Follow the Sun, by the Beatles. 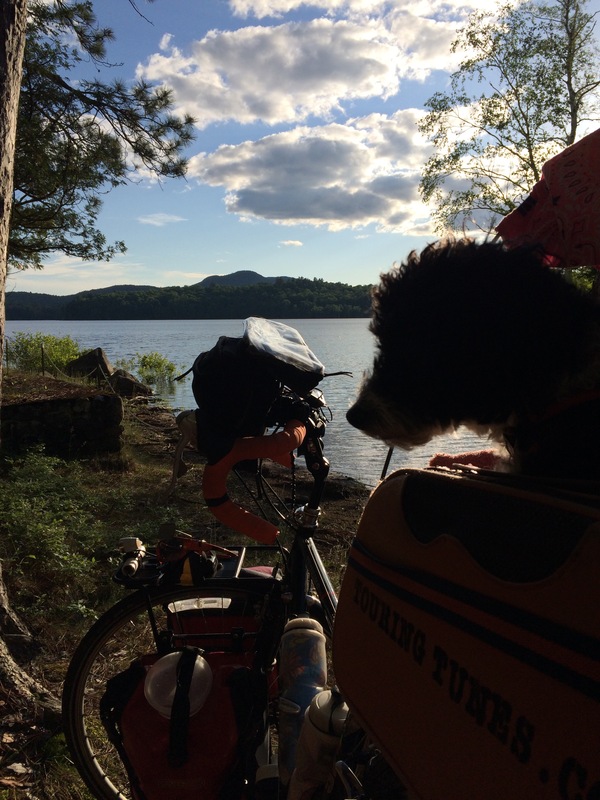 Awesome posts of the last few days……worth the wait…….Have you decided if you’re going to take the Erie Canal Route, or the one that goes closer to Niagra Falls……….The Erie Canal Route to Buffalo has more bike trails for Petunia. Either way , be safe ,and have fun. Thanks, Uncle Mike! We’re going Buffalo to Niagara, with LOTS of bike trails along the way…. hooray!